Today I wrote my last post for the Buffer blog. That blog, as much as the company itself, has been my home for the past nine months. I'm moving on to exciting things, as is the great team I'm leaving behind, but Buffer's not the kind of company you can leave without a goodbye letter. People often ask me how I came to be Buffer's first Content Crafter. The funny thing is, there's no amazing story to tell about that. Buffer posted a job ad for a Content Crafter, and I noticed it because I'd been following the company's progress for a while. I applied, went through the interview process and got the job. All very straight forward. 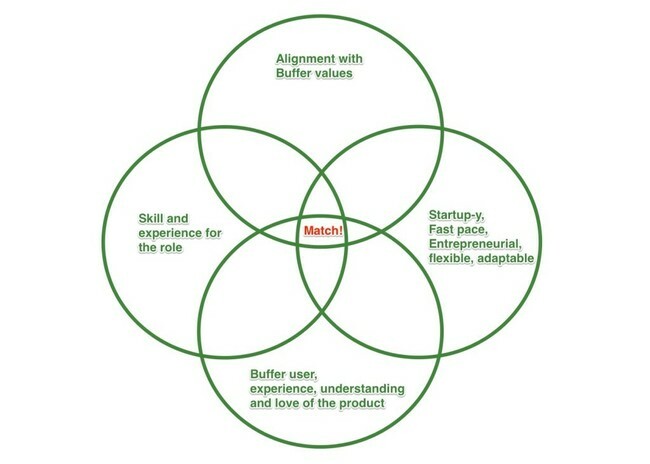 When I applied to work at Buffer, I fit squarely (or circley) in the crossover between those four attributes. That made it an easy choice for the Buffer hiring team. Keep in mind, of course, that I was never involved in hiring at Buffer, so I'm guessing about all this, based on my experience. Since then, I've had more to be grateful for than I ever expected. I've improved my skills as a writer, broadened my interests and read a lot, learned a ton about content marketing and the ins-and-outs of running a startup, and been privileged to receive feedback and support from an awesome team of people. There's a reason Buffer is so careful about hiring: our team is what makes the company what it is. I haven't had a chance to meet any of our team in person yet but I look forward to catching them all at some point in the future. I read somewhere once that the biggest reason a person chooses to remain in their job is their relationship with their boss. Essentially, you experience the company at large through your immediate superior. I'm sure this is even more the case in large companies, but I think working remotely reinforces this, as well. There were many stretches of time where I barely talked to anyone else besides Leo, who managed my work for the biggest part of my time at Buffer. Leo's encouragement and support for me personally and professionally has been seemingly without bounds. I can't emphasise enough how important he's been to my experience at Buffer, and I think this would probably apply to many people who work remotely, in that your boss becomes your lifeline to the rest of the company in a lot of ways. With Leo's guidance, I've improved my work to where I'm quite proud of the difference in what I write now, compared to when I started at Buffer (though I know I have a long way to go yet!). We also worked together to increase the baseline traffic and email subscriber numbers for the Buffer blog, and I've been lucky enough to see my work published on Fast Company, Lifehacker, The Next Web, Time, Huffington Post, Inc and Business Insider. I dipped my toes into podcasts, interviews and print magazines and made a bunch of new friends and connections. In short, it's been a blast. Leo once shared an analogy with me about Buffer, in which Buffer is a rocket ship and each team member is hanging on to the side—rather than being left behind, Buffer pulls us all up with it and helps us to develop personally as well as adding value to the company. I can attest that this analogy rings true in my case. I'm humbled to have had the opportunity to be part of the Buffer journey. I know there are lots of exciting things ahead for the team (including hiring!) and I'll be cheering them on as they continue to grow. So what's next for me? I'm pushing forward with Exist, gearing up for public launch and focusing on our users. I'll still be writing for the Ooomf blog, and I'm also available for freelance writing in a similar vein: science, psychology, creativity and productivity topics float my boat, so if you're interested, get in touch.